Eyewear leader Luxottica Group and Duty Free Americas have partnered to develop a new stand-alone Sunglasses boutique at Punta Cana International Airport’s Terminal A, Dominican Republic. 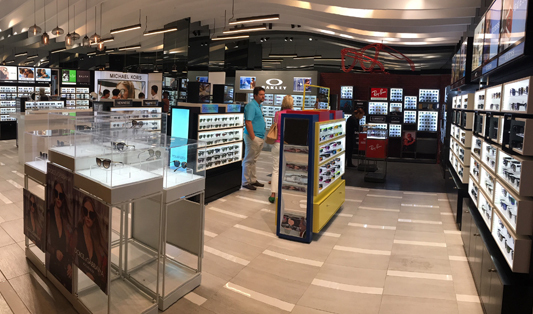 This cutting-edge store – which was custom-designed for the location – is the first stand-alone space for the sunglasses category operated by DFA. Built on sunglasses category management principles, the boutique places renewed emphasis on an optimized product assortment and enhanced shopper engagement. 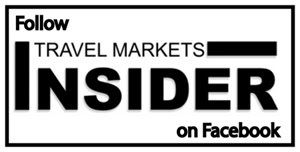 Punta Cana International Airport – with over 7.3 million passengers passing through it in 2017 – is the busiest and fastest growing airport in the Caribbean, with the airport owner and operator, Corporación Aeroportuaria del Este, targeting 10 million passengers by 2020. The new 100 sqm multi-brand sunglasses boutique was created as part of the second-phase of a major refurbishment of DFA’s retail footprint at the airport. Opened in Q1 2018, the store carries 23 brands with space for more than 1,300 individual SKUs, while also featuring a shop-in-shop dedicated to the region’s leading brands, Ray-Ban and Oakley. With an inviting, premium look and feel, the store features a highly visible video wall at the entrance, while an adjacent dedicated promotional space encourages passengers to dis-cover the latest models from featured brands. Other highlights include a dedicated Polarized zone and an eye-catching Kids zone. A “style bar” provides a comfortable space for passengers to try on sunglasses assisted by a team of four dedicated sunglasses-specialists from DFA’s staff. 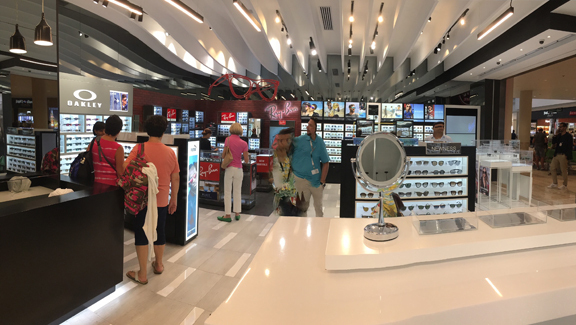 Alessandro Pozzi, Global Channels Director at Luxottica comments: “This stunning new store at Punta Cana airport delivers a first-class retail space and big step forward in the shopping experience. As a major destination for international holiday-makers and with major investment in the airport infrastructure, Punta Cana has huge potential for sunglasses sales, and we hope to maximize that potential with this initiative. “Based on the most recent performance, this new store is trending towards becoming DFA Group’s best-performing space for our category,” says Pozzi.